Olympus OM-1 or Fujica ST-801? They were launched at the same time (1972), and were both highly innovative. In different areas. The Olympus OM-1, the first of a family of cameras which sold until the end of the twentieth century, was remarkable by its small size, its impressive viewfinder, its great built quality, and its very good ergonomics. Olympus OM-1n MD – a very clean copy. A triumph of industrial design. The Fujica ST801, although not a large or heavy camera by any means, looked bulkier and more primitive in comparison, but in 1972 it was very advanced technologically – the first to combine the use of Silicon diodes for metering with LEDs for the semi-automatic determination of the exposure in the viewfinder. And – with full aperture metering and a shutter capable of 1/2000sec exposures – it was the most elaborate of the screw mount cameras. With the OM-1, Olympus introduced a whole new system (new bayonet, new lenses, new motor drives), as compact as the camera itself. 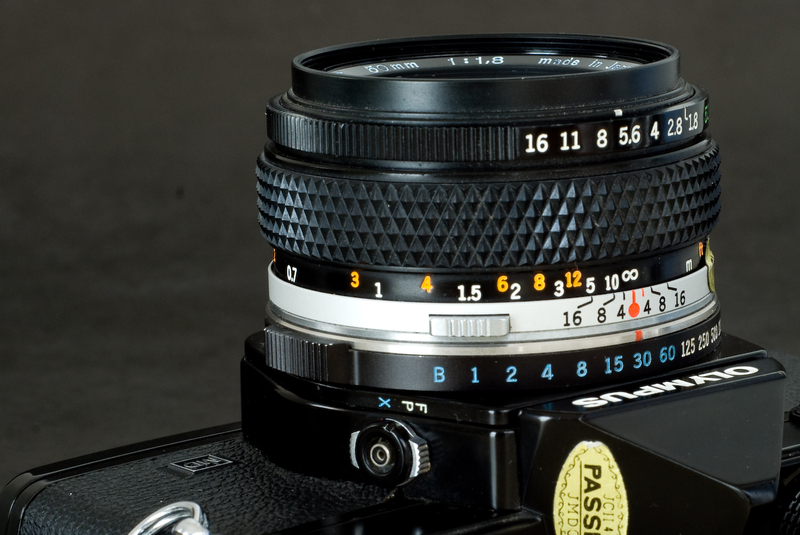 The OM-1 was a starting point. Fujica ST801 – the lens mount flange is surrounded by a recessed and spring loaded rotating ring. The little pin on the rotating ring is pushed by the tab at the periphery of the lens. The ST801 could use any screw mount 42mm “universal” lens, but could only offer full aperture metering when equipped with a new range of Fujinon lenses, which added an aperture transmission mechanism and a locking pin to the standard 42mm mount. The screw mount standard was already at the end of its route when the ST801 was launched, and in 1979 Fuji was the last major camera manufacturer to abandon it for a new proprietary bayonet. The ST801 had no real successor, and the relative short production run of the Fujinon lenses explain why they’re so scarce now. Back then: how did the two cameras compare? Cost and Availability: Both brands were widely distributed, in brick and mortar stores and by mail order distributors. In 1977, the OM-1 was still the only high quality small size semi-automatic SLR, and as a result Olympus was in the position to extract a very significant premium for it. The OM-1n (with a f/1.8 50mm lens) was selling for almost $300.00 in 1977, when Nikon could only ask $270 for a Nikkormat FT3. 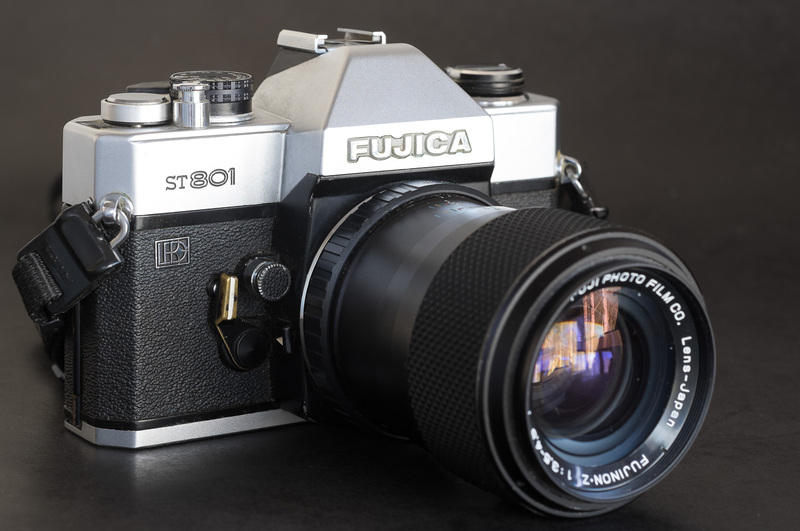 The Fujica ST801 (which was at the end of its career) was selling for approximately for $200.00, in the same ballpark as the old SR-T models from Minolta. It was more expensive than the other screw mount cameras from Practika or Vivitar ($170.00) but significantly less than semi-auto cameras of the newer generation such as the Canon AT-1: $ 240.00 (all figures sourced from the Sears catalog of 1977 – courtesy http://www.butkus.org/). Shutter and metering system: Both cameras use a shutter with horizontal cloth curtains. The OM-1’s tops at 1/1000sec, the ST801 at 1/2000sec. It probably did not matter much in 1973 (when 64 ISO was the normal film sensitivity) but a faster shutter speed is a serious advantage today (400 ISO is the normal sensitivity for negative color and B&W film, and photographers looking for “bokeh” use very wide apertures). The OM-1’s metering system is very conventional (2 CdS cells, mercury battery, matching needle at the left of the viewfinder). The ST801 was the first camera to use Silicon photo diodes for metering, and LEDs. Advantage Fujica. Olympus OM-1 – the commands layout is unique (large on/off switch, knob for the film sensitivity, a ring on the lens flange for the shutter speed, and the aperture ring at the far end of the lens). Battery: The ST801 uses one 6v silver oxide battery (the same as the Canon AE-1), which is still easy to find. The OM-1 was originally designed for Mercury batteries, which have disappeared from the market a long time ago due to the health hazards represented by Mercury. Mercury batteries deliver 1.35 volts. The simplest option is to use the zinc-air batteries sold by pharmacists for hearing aid devices – they deliver the same voltage, are very cheap and ubiquitous, but have a limited life (a few months at most) once they start being used. Other options exist (like having the camera converted to the voltage of silver oxide batteries – 1.55v) but I don’t like the idea of opening the camera and soldering diodes on the circuitry that much. My take on it: live with the zinc-air batteries, or buy an OM-2. Advantage Fujica. Lens selection: In my opinion, the ST801 only shines with lenses supporting full aperture metering. Except for the most common focal lengths (50mm, 135mm and the 43-75mm zoom) Fujinon lenses designed for the Fujica ST series are difficult to find, and seriously expensive when you can locate one. A more cost effective option is to use Tamron Adaptall lenses – Tamron developed an Adaptall Mount Adapter specifically for the Fujica ST cameras – the mounts are still available at a very moderate price, and the Tamron lenses are less expensive than Fujinons. Olympus OM Zuiko lenses have an excellent reputation. They were often offered in three versions representing three price points (slow aperture, medium aperture, fast aperture) for every major focal length category. Today, while the faster lenses are rare and expensive, the slower ones are still easy to find and comparatively cheap, much more so than the Fujinons. Big advantage for Olympus. 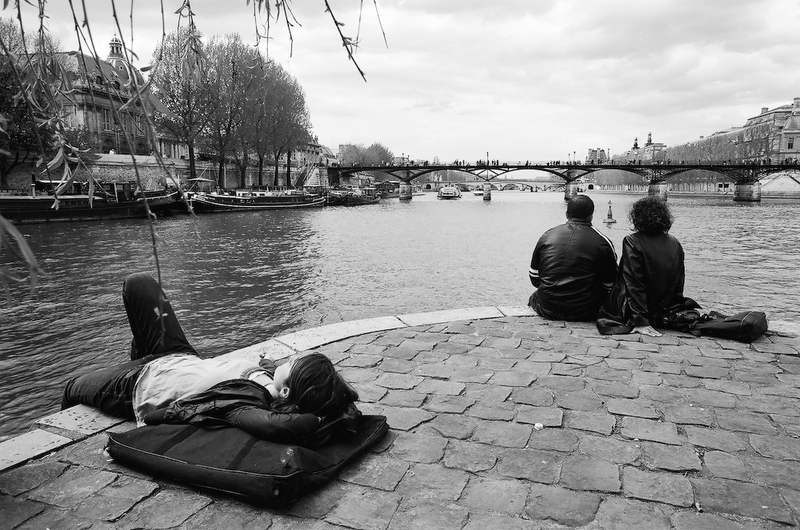 The usage value of the two cameras is the same – both are good semi-auto exposure cameras. the Olympus has the better viewfinder, a significantly wider lens selection on the second hand market, and it looks and feels more modern. The Fujica’s metering system and its shutter are better, and it works with a myriad of screw mount lenses. You can argue that the Fujica line of SLRs reached its peak in 1972, with the ST801. The subsequent screw mount models (ST901, AZ-1) were designed with amateurs in mind (auto exposure cameras without any semi-auto mode), and the last screw mount Fujica cameras were budget models priced just above Praktica cameras from communist East Germany. This whole line of cameras and lenses met its end in 1979 when Fuji switched to its new X bayonet. If you consider the whole system, spending your cash on Olympus makes much more sense. The OM-1 is the first member of a large family. It’s a nice camera of high historical importance, but in the OM system, there are even better choices: the OM-2 and the OM-4t. In semi-auto mode, the OM-2 works exactly like an OM-1. It also operates in Aperture Priority auto-exposure mode, offers a pioneering flash metering system and accepts silver oxide batteries. If you wanted to spend a lot more money, the OM-4t with its 1/2000sec shutter, its very elaborate metering system and its titanium top plate would be my recommendation. It was sold until 2002, and is often considered the pinnacle of 35mm manual focus SLR design. 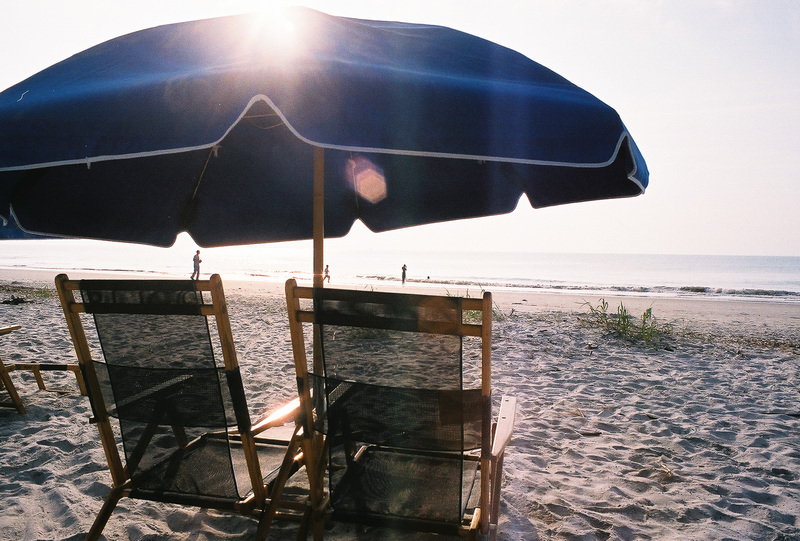 Hilton Head – 2010 – Shot with an Olympus OM camera. ← Should we start collecting digital cameras?